Welcome to Hi Tech Luxury Imports website, a fast and convenient way to discover the perfect vehicle for you. Whether you are looking for a new or pre-owned Aston Martin, Bentley, Lotus, Maserati or Rolls-Royce vehicle, we’ve had an extensive inventory of exotic vehicles to meet your needs. We have helped customers from Austin, Dallas, Houston, Waco, Killeen, Round Rock, College Station, San Marcos, Victoria, Rockport, Corpus Christi, El Paso, San Antonio, Laredo, Brownsville, McAllen, San Benito, Edinburg and Mission find the vehicle of their dreams. 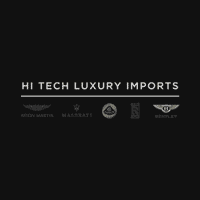 Hi Tech Luxury Imports is a dealership that belongs to the largest luxury automotive group in Austin, Hi Tech Motorcars. As a dealership, we specialize in selling and servicing high-end vehicles. We provide a car buying and service experience unlike any other, setting a new standard for how luxury car dealerships should operate. We know that our potential customers are well educated when researching their next vehicle. Hi Tech Luxury Imports makes it easy to get all the available vehicle information so you can spend less time researching and more time falling in love with your new car. Come see us at our dealership located in Austin, Texas today.